Triny Finlay is the author of Splitting Off (Nightwood Editions, 2004) and the chapbook Phobic (Gaspereau Press, 2006). Her poetry and reviews have appeared in various Canadian journals and magazines, including The Antigonish Review, Broken Pencil, CV2, The Fieldstone Review, The Fiddlehead, Grain, Idea&s, Modomnoc and Other Voices. Her feature review entitled “Back to the Modern: Three Ottawa Poets” recently won the 2007 Critic’s Desk Award at ARC Poetry Magazine. She has been featured on CBC.ca’s Words At Large and her work has been anthologized in Breathing Fire 2: Canada’s New Poets, Qwerty Decade, and Gaspereau Gloriatur. She holds degrees from Mount Allison University and the University of New Brunswick; currently, she is completing a PhD in Canadian Literature at the University of Toronto. David Hillis is a young poet from Uxbridge, Ontario who is relatively new to the poetry scene. His poetry received both first prize, for The Bookstore, and the second place honourable mention prize for Apocalypse Now in the Penstrokes poetry competition. David enjoys writing poetry and playing music. He will be moving to Montreal in the fall to attend Concordia University to study Philosophy and Creative Writing. David’s poetry employs rich, gripping language to describe the conflict of the human condition. 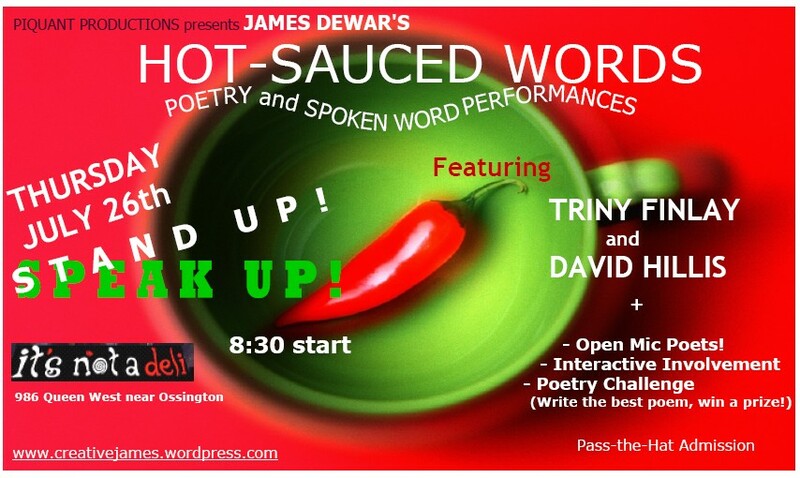 Personal note: I first became aware of a very talented emerging poet, David Hillis, at the open mic at a Hot-Sauced Words show in Uxbridge earlier this Spring. This is his first ever feature in a Toronto venue and combined with the fabulous poetry and delivery of Triny Finlay, this phenomenal pairing of poets is not to be missed.